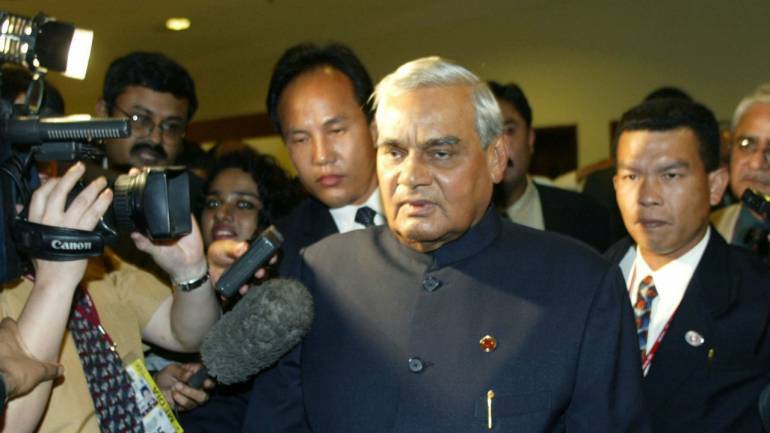 Singh, who visited the AIIMS twice during the day when Vajpayee was on life support system, said that with his demise, the nation has lost a stalwart who had dreamt of an India. The body of former prime minister Atal Bihari Vajpayee is being taken to his residence in the national capital where people can pay their last respects, Home Minister Rajnath Singh said today. Singh, who visited the AIIMS twice during the day when Vajpayee was on life support system, said that with his demise, the nation has lost a stalwart who had dreamt of an India where "all persons lived together in unity, peace and harmony". "Vajpayeeji's body is being taken to his residence where people can pay their last respect," the home minister told reporters here. Describing former prime minister's death as a "huge personal loss", Singh said he was pained beyond words at the demise of Vajpayee, who had cherished the ideal of a developed and powerful India. "In Atalji's demise the nation has lost a stalwart who was known for statesmanship and astute leadership. Atalji was a true 'Ajatshatru' (man with no enemies) who had many friends across the political spectrum. He believed in political consensus and his beliefs had consequential effect on Indian politics," he said. The home minister said he joined millions of Indians who drew inspiration from Vajpayee's life and contribution. "I cannot fully imagine my own life without following the footprints that Atalji set. May his soul rest in peace," he said. The 93-year-old leader passed away today at AIIMS here.